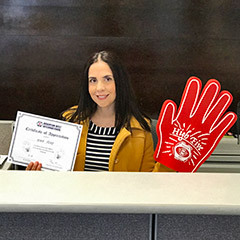 The High Five Award recognizes Brighton-Best International (BBI) employees who come up with new game changing ideas across all BBI departments. Our employees are what makes BBI the BEST. Brighton-Best International (BBI) operates 30 stocking warehouses worldwide. Servicing distributors only, BBI has expanded its distribution footprint to over 1 million square feet, servicing its customers through 20 distributions centers in the United States. The new BBI has redefined value with expanded facilities, an interactive website, and an expanded product line. Responsible for the sale of products through developing and maintaining customer relationship within an assigned territory. Develop new customers through cold-calling and other sales activities including outsides sales calls. Maintain accurate records and an organized work environment of drywall houses. Establishing new sales opportunities in an exciting environment. Follow up on repeat orders to ensure customer orders are filled in a timely manner. Represent the Proferred brand as a drywall sales specialist. Highly motivated, enthusiastic, dependable and persistent personality. Sales background in B2B is preferred, but not required. Must be a self-starter with a strong commitment to achieve company sales goals. Working knowledge of Microsoft Office and internet and possess excellent phone and email communication skills. Employment history in construction or drywall products (Preferred). Proficient in English (Bilingual a Plus). Ability to successfully interact with all organizational levels.